History comes alive within the walls of this 14th century style castle. Details have been painstakingly recreated so your students personal journey truly transports them back to the Middle Ages. 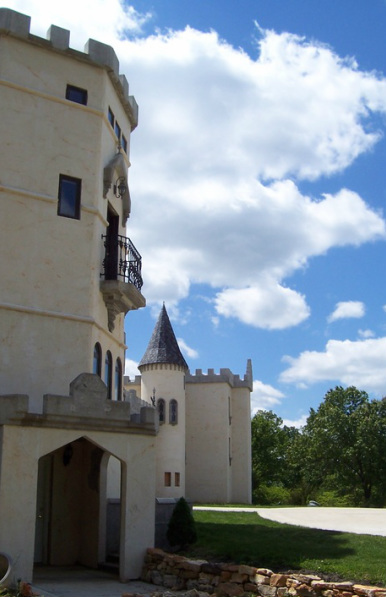 Chateau Charmant is modeled after a 14th Century French Chateau. And so it acquired its name Chateau Charmant or "Charming Castle" in French. Much like King Ludwig II of Bavaria, who in 1869 built Schloss Neuschwanstein in Bavaria as a retreat and in homage to Richard Wagner, Robert Palmer not only had the romantic vision to build this castle for his wife, he has designed and constructed it himself with only the help of his wife and daughter and an occasional friend. This vision Robert had to build his wife a castle is reminiscent of the great love the Shah Jahan had for his 3rd wife Mumtaz Mahal. The Shah had the Taj Mahal built in 1632 in memory of her. Another Fairy tale history example of great love and hard work. Each room of Chateau Charmant is painted to reflect a different castle from Europe. Which brings history to life here in the Midwest. A visit to Chateau Charmant will greatly enhance your class room lessons by providing a visceral education for the students learning experience. Imagine yourselves transported back in time at this magical secluded kingdom. Lunch and medieval games are included in the package price (if food allergies are present let us know at time of booking).